Final render with post work. The impetus for this exercise -- learning how to overlay a model on a raster image for reference. A simple coffee pot created by following a tutorial. Blah. The spark plug I modeled from scratch. 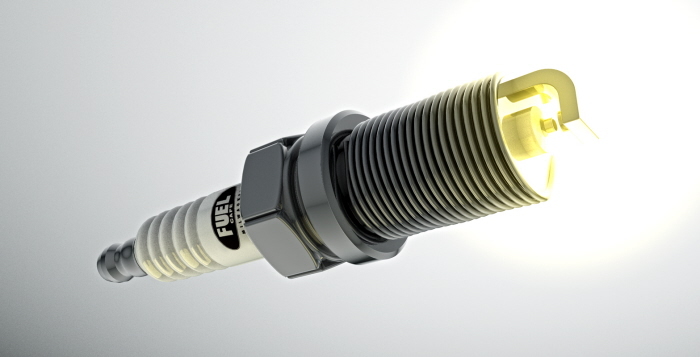 A rendering of the same spark plug model. The impetus for this exercise was learning how to overlay a model on a raster image for reference. Thanks to all of the practice prior to this, the rest of the model was fairly by the book. Nonetheless, I can't thank Greyscalegorilla enough for the free education in Cinema 4D. If you need to learn 3D, I highly recommend their tutorials. The coffee pot created by following the tutorial. This was fairly boring. Following instructions to make something is neat, but not creative. It was time to do something more than simply follow a cookbook. I choose the logo of my favorite coffee shop back in Milwaukee and vectorized their racing logo for use in the model. While doing so, I couldn't help but notice that Fuel's website was competing in Google with other coffee houses calling themselves "Fuel Cafe". Apparently, they now had to underscore that they were the original. I used this new branding as inspiration. point to do something broader than a practice exercise. Don't mind the chicken-scratch on the sketch -- I hadn't hand lettered a comic strip in twelve years at this point. The coffee machine and lightning bolts shaped up nicely. I didn't get too crazy putting detail in to the coffee maker since I didn't want to distract from the composition in the end. Taking design nods from my favorite coffee shop's website, I begin to vectorize parts to incorporate into a new model. I'd go on to search my own photo library for the background I use in the shot and research the type of coffee maker they use. I wound up modeling a spark plug from scratch using a generous number of loft nurbs for the top and a helix with sweep nurb for the threads. The final image of the slideshow consists of the completed piece, after a lengthy render. A bit of iris blur and some HDR action were added in Photoshop. This project was a lot of fun for something that started as a simple bit of practice!